MSNBC's feisty debate between Bernie Sanders and Hillary Clinton received high marks from political observers, but not high ratings from ordinary viewers. With 4.5 million viewers, it was the lowest-rated debate of the 2016 election cycle by far, according to Nielsen data. The prior low was 7.8 million viewers for ABC's Democratic debate on the Saturday night before Christmas. 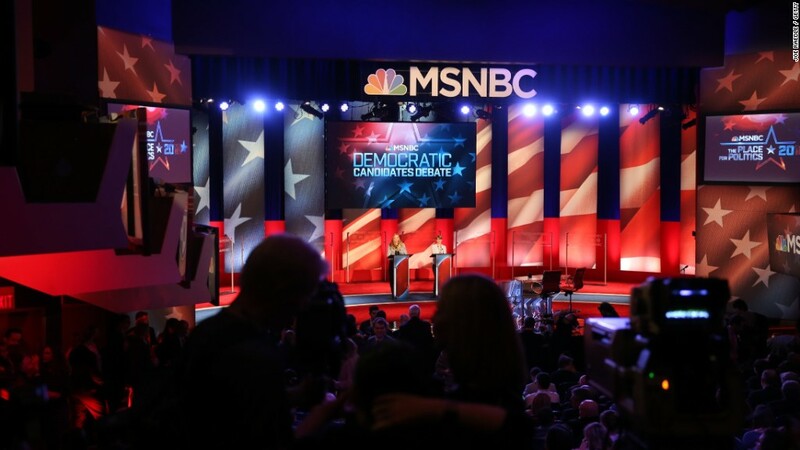 MSNBC's debate was a late addition to the lineup, originally announced just over a week ago and not officially sanctioned by the Democratic National Committee until this week. But the channel heavily promoted the debate on Wednesday and Thursday. The ratings results may suggest some measure of debate fatigue among viewers. MSNBC may have also faced structural disadvantages because it is generally lower-rated than Fox News or CNN. On the other hand, the 9 p.m. hour when the debate started is usually MSNBC's highest-rated hour, with about one million viewers a night watching Rachel Maddow's show, which has been regularly eclipsing CNN recently. For comparison's sake, the most recent Democratic debate, televised by MSNBC's sister channel NBC in January, had about 10 million viewers, more than double Thursday's result. That January debate was on a broadcast network, which has a wider reach than a cable news channel. But up until now, in this Donald Trump-fueled election season, cable debates have out-rated broadcast debates. The most recent GOP debate, a Trump-free match-up on the Fox News Channel, had 12.5 million viewers, and that was considered underwhelming by Fox and GOP debate standards. The Democratic debates have drawn smaller audiences, but have still surpassed comparable totals from the 2008 primary season. Thursday's two-hour session, moderated by Maddow and Chuck Todd, represented the first time Clinton and Sanders sparred head-to-head, without Martin O'Malley on stage with them. Some Twitter critics said it was the best debate of the election cycle thus far, burnishing the brands of Todd and Maddow. Can't wait until the GOP gets down to two or three candidates. This was the best debate of the season. In fact, only real debate per se. Maddow was criticized in some quarters, however, for hugging the candidates afterward. On Fox News Friday morning, Geraldo Rivera called it the "home team debate." Rachel Maddow embraces both Clinton and Sanders at end of debate. I don't think I've ever seen a moderator do that before. Thursday's debate still out-rated this week's other televised event with Clinton and Sanders, a New Hampshire town hall televised by CNN on Wednesday night. The town hall had a 2.0 overnight rating and about 2.7 million viewers. Clinton and Sanders will meet again next Thursday in Wisconsin in a debate produced by PBS. It will be simulcast on CNN and CNN.com. Their GOP rivals will debate again this weekend, on Saturday night, on the ABC broadcast network.